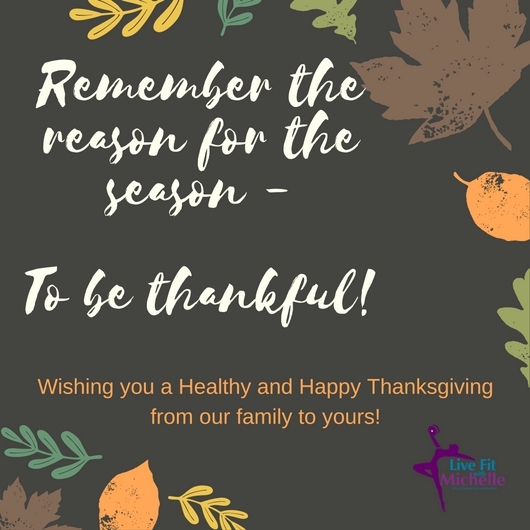 I am thankful for all of you - loyal clients and friends who have supported me in pursuing my dream - to bring fitness and health to others! With Thanksgiving just one day away, I am sure everyone is feeling the time crunch as they either need to hit the grocery store for last minute ingredients, need to start preparing their favorite dishes tonight, or need to get packed and out the door to travel to see loved ones. In the hustle and bustle of the holiday, I think we have forgotten the reason for the season - To have gratitude and give thanks! Somehow the holiday has become more about food and football and less about being thankful for our blessings and being thoughtful and kind to others. According to the National Academy of Sports Medicine (NASM), the average number of calories consumed on Thanksgiving is 4500 calories, with 1500 calories alone consumed while snacking before dinner!! This is more than double the amount of calories the average person should have in 1 day. Did you know that running for 30 minutes at a pace of 6.5 miles per hour, the average person burns between 300-400 calories! So to burn off 4500 calories, you need to run at a pretty fast pace for a LONG time! If this doesn't make you think about your consumption tomorrow, I don't know what will. I want to challenge you this Thanksgiving to slow down and be present! Let your kids join you in the kitchen as you cook, sit down and enjoy conversation around the dinner table, be present in the moment and savor every bite and be thankful for all that has come before you and all that lies ahead. There is nothing too small to be thankful for. Tomorrow is a precious day that should be filled with memories. Don't waste the day rushing through a meal and stuffing yourself so that you have no energy and motivation to move. Instead, be present and be thankful! 1. Don't skip your workout! No matter what you have going on tomorrow, I am sure you can find at least 20 minutes to move your body. 2. Eat well before Thanksgiving dinner! Do not make it your first meal of the day as you will be starving and unable to control portions. 3. Appetizers may be tempting but before you stuff yourself with chips and dip, think about the big meal ahead. Are you planning on having dessert after dinner? Make the conscious choice to control your appetizer portions so you have room for your favorite dishes at dinner and perhaps even room for dessert. 4. Serve yourself a healthy, balanced plate! Load up on 1/2 veggies, 1/4 grains and starch and 1/4 turkey. 5. Drink a glass of water and wait 20 minutes before heading back for seconds! This gives your stomach some time to digest the food you have eaten and sends you the signal that you are getting full well before the overstuffed feeling sets in. 6. Drink water throughout the day and keep alcohol to a minimum. Consuming alcohol may impact your food choices, add empty calories to your day and make you feel bloated. Make a plan of how much alcohol you are going to have and stick to it! 7. Treat yourself to your favorite dessert if you have room for it! This does not mean 5 slices of pie. 1 slice of pie is plenty!